Philippines' number one mobile brand Globe Telecom continues to lead the country's digital revolution as it recently expanded its Direct Carrier Billing (DCB) service to include customers on Microsoft Lumia smartphones running on the Windows operating system (OS). 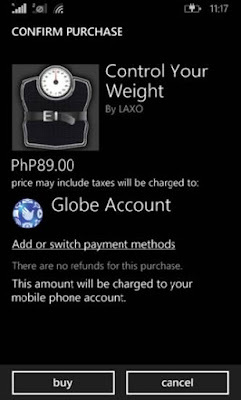 With Globe being the first telco to bring the service to the Philippines, the new Windows Mobile Store direct carrier billing service gives Microsoft Lumia and Windows phone users an easy, convenient, and secure channel to download and purchase their choice of mobile applications and in-app content without the need for a credit card. Rolling out starting June 18, 2015, the service will allow all Globe Postpaid, Prepaid and TM customers to charge their Windows Mobile Store purchases straight to their postpaid bill or prepaid load. "This new innovation that will benefit our customers using handsets running on Windows OS is another testament to our thrust to bring the country to the global digital landscape. The expansion of our direct billing service to cater to purchases via the Windows Mobile Store now presents a truly hassle-free and content-rich mobile experience to all our customers using Windows phone devices," says Griselda Go, Vice President for Content at Globe. The Windows Mobile Store app comes pre-installed on all supported Windows phone devices with OS 7.5 and above, and is pinned to the Start screen within the App List. Premium content available for download and purchase includes games, in-game items and goods, virtual currency and points, virtual goods from social networks, subscriptions for granted access for games, and even E-books. To access the Windows Mobile Store, users must first set up their device's location to determine which Windows Mobile Store catalog and payment options will be made available on the device. The app will automatically recognize Globe as the mobile phone's carrier and will determine it as one of the payment methods available. Go pointed out that the Globe direct carrier billing service for the Windows Mobile Store forms part of the company's initiatives that will cater to the country's ever-growing digital landscape. Other initiatives in the pipeline include the launch of Single Bill service which will expand direct carrier billing beyond mobile applications by allowing customers to purchase applications and in-app items for Desktop/PC and Xbox. Globe Telecom has maintained its dominance in mobile data business in the first quarter of the year after posting mobile data revenues of P4.4 billion, double the combined revenues of its competitors at P2.2 billion. As of March 2015, Globe mobile data revenues significantly grew by 58% from previous year's P2.8 billion and by 8% from previous quarter's P4.1 billion. Meanwhile, combined mobile Internet revenues of Smart and Sun rose by 19 percent to P2.2 billion from P1.9 billion in the same three months of last year.